When I was in Kindergarten, my mother picked me up from school one afternoon brimming over with a surprise. Whatever was the secret? I wondered. I begged; I cajoled; I whined; she wouldn’t tell. We pulled into a parking lot I’d never visited, and walked into the most wonderful building ever, full of people and dogs. My mother told me it was The Vet. What was The Vet? It was the place where Good Pet Parents take their pets to visit the doctor, get their shots (I cringed; I hated getting shots myself and felt sorry that pets also had to have shots), and get medicine if they’re sick. It was possibly the greatest place I’d ever been – but there was one teeny problem: We didn’t HAVE a pet! My mother ignored this observation and instructed me to sit on a chair against the wall, and not to touch any pets without asking permission first. Of course, as soon as she turned her back and walked up to the counter, I sidled up to a man with a very large dog whose ears were bandaged. Is he hurt? I asked. No, the man responded; this sort of dog was called a German Shepherd, and his ears were supposed to stand up by themselves, but since they weren’t standing up The Vet was using tape to help them learn to stand up. Only then my mother turned around and beckoned for me, and so I trotted up to the counter. The lady behind the counter carried a towel over, laid it on the counter, unwrapped it… and there was a scruffy little wire-haired dog with one ear that stood up and one that laid down. My mother said it was ours, Our Very Own Puppy. I pointed to the German Shepherd and wondered if Our Very Own Puppy ought not have her floppy ear taped so it would stand up. My mother said no, that she liked it that way. We named Our Very Own Puppy Pepper. She was a wire-haired terrier mix, with a long, low build that makes me think now that maybe there was some doxie in the mix somewhere back along the line. Pepper was a spunky little firecracker, and stayed in trouble. We had her until I was eighteen years old – she was fourteen, and it was her time. 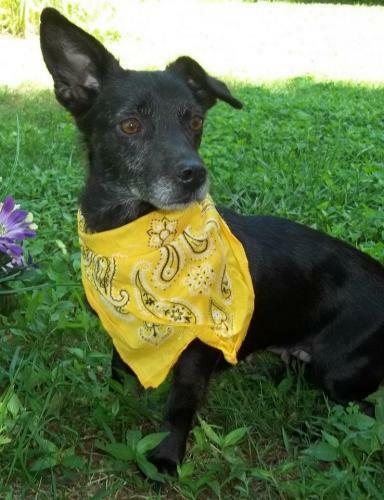 When I saw that little black doxie mix with one perky ear and one floppy ear on Facebook last summer, I immediately thought of Pepper. I went and picked her up the very next morning. She attached herself to me and within two days she knew that her name was, in honor of my childhood best friend, Pepper. I took little Pepper everywhere. She was such a great ride buddy – and I hardly ever had to use a leash, because she stuck to me like glue. Of course I posted her picture on Petfinder, and on Facebook, and listed her as Available for Adoption, because I needed another dog like a hole in the head. It just wasn’t meant for Pepper to leave me. No one ever showed any interest in her, and I was secretly glad. Pepper could be snarky, and she could be a nasty little piece of work, but she loved me fiercely, and I loved her too. Unfortunately, little elderly dogs are prone to senility and dementia just like little elderly humans, and Pepper was not immune to the condition. She started recoiling from my touch in fear a few weeks ago. There were times I would reach to pet her and she would bite my hand even as she hit the ground screaming like I was killing her. Yesterday she bit me and within an hour had started a nasty unprovoked dog fight in my living room. When I broke up the fracas I put all involved parties in crates to cool down. I waited a good twenty minutes before letting Pepper out of her crate and she promptly bit me again, drawing blood this time, and screaming the whole time like someone was scalping her. It was with a heavy heart that I picked up my cell phone and called my vet, who is the best vet who ever practiced medicine. Of course they could work her in on their Saturday half-day clinic; how soon could I be there? I got dressed and convinced Pepper to let me pick her up. She was confused by the whole proceeding; she wanted to sit in my lap in the car, but she snapped at me if I tried to touch her. She cowered against me when she heard Doc in the back, and growled and snarled so that we had to muzzle her so she didn’t bite him. When a little dog is suffering from such paranoid dementia that she fears even you, who I know good and well has never hurt this or any dog, then it’s time to let her go to that place where there is no more fear and she can be happy and young again. My poor little second Pepper went to the Rainbow Bridge yesterday. No one else in the world wanted her… but I loved her for the nine months I had her, and I hope that her last months were some of the happiest of her life. That little dog worshiped the ground I walked on, and when she crossed the Bridge she carried a piece of my heart with her. Be fearless again, little Pepper dog. Tell First Pepper and Sandy, Mandy and Scruffy, and Rosie and Bonnie and Szundi and Dusty and Chinook and all the other great dogs I’ve loved that I look forward to meeting you all again. Oh Lord that is so sad. I know how it feels. This is something more people need to know about. It took me far too long to figure out that one of my dogs had this problem before I peacefully put him out of his misery. It was awful. Far too many bad situations occured because of this conditon. I still can’t look at pictures of my sweet baby because of the many times I lost my patience with him wondering why he was being so mean. You did a good thing. Two times. First by giving Pepper a happy home to cross over in and helping her to cross over while being loved. I have to go cry now. Awwww, thank you – I wish I’d recognized it a lot sooner; I just thought she was being a nasty little dog and fussed at her for being nasty. I feel really guilty now because now I know that it wasn’t part of her normal nastiness. You’re right – it’s definitely something that needs more press, because people don’t realize that aging dogs lose their minds like people do.